Constructed of Marine Grade plywood, not cardboard or particleboard. All horizontal surfaces are made of 3/4 inch plywood for strength and stability. Covered with soft High-Quality, dense pile carpet. Available in many colors! The top section, above the house, sits in a pocket and slides up and out for convenient transport or shipping. Most cats spend a large portion of their day sleeping and resting. 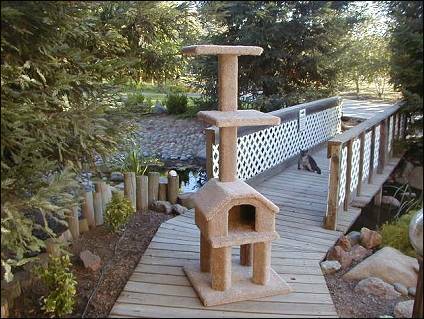 Why not provide yours with high-quality Affordable Feline Furniture!